Priscilla Warner has had a great life: a supportive husband, a flourishing marriage, two loving sons, and a bestselling book, The Faith Club. Despite all her good fortune and success, she suffers from anxiety and panic attacks so debilitating that they leave her unable to breathe. She’s tried self-medicating—in high school, with a hidden flask of vodka—and later, with prescription medications—daily doses of Klonopin with a dark-chocolate chaser. After forty years of hyperventilating, and an overwhelming panic attack that’s the ultimate wake-up call, Warner’s mantra becomes “Neurotic, Heal Thyself.” A spirited New Yorker, she sets out to find her inner Tibetan monk by meditating every day, aiming to rewire her brain and her body and mend her frayed nerves. On this winding path from panic to peace, with its hairpin emotional curves and breathtaking drops, she also delves into a wide range of spiritual and alternative health practices, some serious and some . . . not so much. Warner tries spiritual chanting, meditative painting, immersion in a Jewish ritual bath, and quasi-hallucinogenic Ayurvedic oil treatments. She encounters mystical rabbis who teach her Kabbalistic lessons, attends silent retreats with compassionate Buddhist mentors, and gains insights from the spiritual leaders, healers, and therapists she meets. Meditating in malls instead of monasteries, Warner becomes a monk in a minivan and calms down long enough to examine her colorful, sometimes frightening family history in a new light, ultimately making peace with her past. And she receives corroboration that she’s healing from a neuroscientist who scans her brain for signs of progress and change. 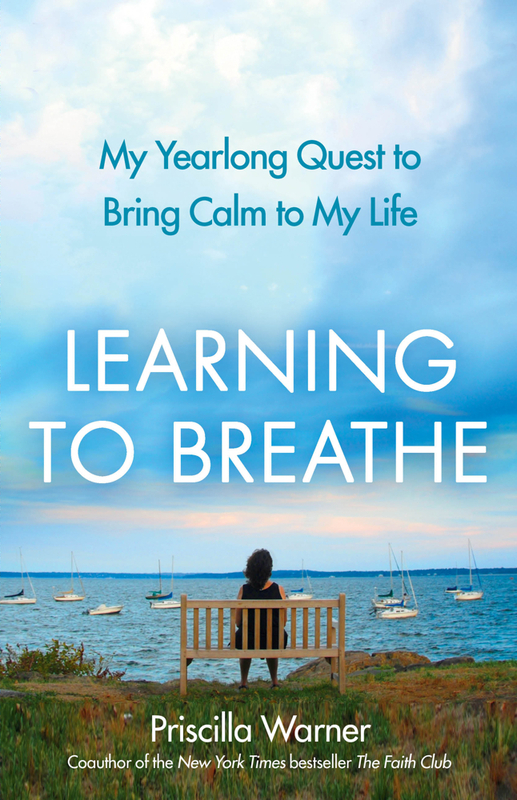 Written with lively wit and humor, Learning to Breathe is a serious attempt to heal from a painful condition. It’s also a life raft of compassion and hope for people similarly adrift or secretly fearful, as well as an entertaining and inspiring guidebook for anyone facing daily challenges large and small, anyone who is also longing for a sense of peace, self-acceptance, and understanding. 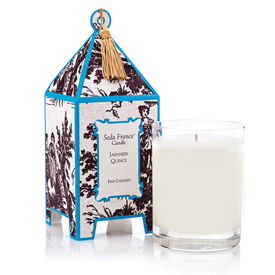 To celebrate the release of her new book, Priscilla is giving a Seda France Japanese Quince scented candle to one lucky reader! It’s the perfect combination of sweet and sharp and it’s her favorite for use during meditation and yoga. Simply leave a comment to be entered. Contest is open to those with a US mailing address and ends at midnight on September 28, 2011. Randomly chosen winner will be announced on September 29, 2011. Be sure to watch for Priscilla Warner on the Today show on Friday, September 23. You can also find her on Facebook and Twitter. thanks for this feature. What a debilitating condition to have to live with for so long. It would be wonderful to read this memoir and to learn more about the author and the background which caused the panic attacks. Many thanks. Please enter me in this lovely giveaway. Namaste! this sounds so relaxing and I would love to win it. Thanks. A perfect giveaway in relation to the book. I am looking forward to reading this one too – I really need to incorporate some stress management techniques into my life so I am interested in seeing how Priscilla did it. Definitely sounds like what my body and soul need right now…how wonderful! Thank you! This book sounds amazing. I loved the video and the images one it. I think the extent of Priscilla’s experiences trying to get to the place the monks are at sounds interesting, entertaining and powerful. I’m thrilled to wrote this book to share her experiences. I know it’s one I have to read. I have tried off and on for years to learn to meditate but so far I haven’t quite made it to that spot. It’s mostly because I haven’t tried long enough and I haven’t done it quite right! I had some panic attacks when I was much younger and I’ll never forget how frightening they were. My heart goes out to Priscilla as I can only begin to imagine how awful her attacks were. I’m glad she’s finally found some peace. Thank you for posting about this book. The video is terrific…I love the image of the dog lying in the snow! Thank you for the giveaway, too! Doesn’t this one sound appealing? I loved the video and the images – water, snow, leaves, grass. They were very soothing. Thanks for highlighting this one, Kathy. My book group read THE FAITH CLUB some time ago. I’ll be on the lookout for this new book. Glad that Priscilla was able to find healing. Please enter my name. Thanks. No need to enter me. I just wanted to say that this is a book I need to read. I’ve got some pretty bad issues with anxiety and panic and most of what I read is always the same old stuff over and over again. I wouldn’t mind reading of the journey she took to feel better. Yum, that sounds like a lovely prize! I think this book would be great for people like me who have chronic pain. Pain ties you up in it and this would help to let go. I have panic attacks but only in rare situations. The candle sounds great too. I could benefit from this book too. A glass of wine and chocolates are my semi-healthy ways of relaxing. Better ways involve long walks in the woods and hours staring at birds and nature, which are preferable but not always practical! I’d love to win this book! I suffered from panic attacks for many many years. Thank God I no longer have them. I would love to be entered for this! Thanks for the great giveaway. this book sounds perfect for me. i don’t know how many times i tell myself a day to just take a deep breath and relax. everything usually works out in the end. Oh, my type A personality dearly needs this book. Please enter me in the give away. This book sounds helpful for those who find the stress of everyday life too much. Also for those with chronic pain, it could be a godsend. I am going to try to get my sister to read it. I have tried for a long time to get her to try some relaxation and meditation methods to help with her chronic pain instead of using all those meds with side effects. I look forward to reading it. I’m sure there are many people out there who could benefit from what she learned. No need to enter me, as I am just going to buy this book. I can relate to this story, as I have a lot of anxiety issues myself, and would love to see the journey that she goes through to towards healing and away from the less successful things she tried. I am glad that you are offering this one to others for a giveaway. Like Jenners said, it will probably help a lot of people. As a self described neurotic New Yorker – being in Colorado for 16 years hasn’t helped – I think I need this book. My anxiety and oct gets worse when I’m stressed and I think I too need to learn to breathe. Thanks for sharing and I am definitely putting this book on my To Read (AND SOON) list! I really liked meeting Priscilla Warner through this trailer. I’ve also heard about this book and was curious. I want to read this now. Thanks for the info. I’ll check the book out! I’m a huge fan of meditation, and this sounds like a lovely memoir. I really enjoyed the trailer, too. Will be adding this one to my list. (I’m not entering the giveaway, though, as I’m in Canada, not the US). I am sure this book would help me as I spend my days watching Parkinson’s disease take my husband away and replace him with someone I love but sometimes don’t fully recognize. I need to stay calm to be a real help to him. Oh I’d love to win a candle especially if it’s one that would help me to relax. This memoir does look good. I’ve never had debilitating panic attacks, but I am chock full on anxiety on a daily basis! I remember this caught my eye when I saw it in your Mailbox Monday! I would love to learn through Ms. Warner’s experiences … any little step toward slowing down is a good step. Please enter my name in the drawing for the giveaway. I can’t imagine being so plagued with panic attacks. I know meditation is very powerful and it’s wonderful that she found a way to slow down — something most of need to do. Please don’t enter me in the giveaway — strong scents can make my eyes water. I could stand a little serenity these days, haha. Looks great! happy to hear that she has found that inner peace. not an easy feaat in today’s chaotic world. Love the way you welcomed LIFE as LIFE served itself upon….you embraced it and rolled with the currents of Grace.